Trinidad and Tobago will put US$100,000 into a fund which has been set up by Caricom to fight the Ebola virus in affected West African countries. 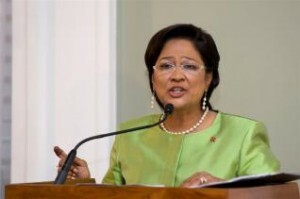 Prime Minister Kamla Persad-Bissessar made the announcement yesterday, following a special meeting of regional heads of State at the Diplomatic Centre in St Ann’s. Antigua and Barbuda Prime Minister Gaston Browne said the fund has been dubbed “Stop Ebola Here and There (SEHT). he made the comment as he gave details of a ten-point plan to both fight the disease at the source and keep it out of the region. Yesterday’s 17th Special Meeting of Caricom was called by Persad-Bissessar to discuss the Ebola virus, which has not had a case in the region, and chikungunya (ChikV), which is currently devastating working populations in 23 of the 24 member states of the Caribbean Public Health Agency (Carpha). This entry was posted in Local News, News. Bookmark the permalink.